Is Your Pool Filter Leaking? Pool filters can last many years in Winnipeg. However, like any other plastic pool components, they can get brittle with time. The top head of your pool filter can begin to leak internally or externally, and you may notice that your water is not crystal clear like it should be. Swimming in murky, dirty water takes all of the fun out of summer days in the pool. A pool filter is necessary for keeping your pool water pure, healthy, and attractive. How Much do Pool Filters Cost in Winnipeg? Depending on their type and size, a pool filter can cost anywhere between $850 and $2,000, including the installation process. Sand Filters: Sand filters use a sand medium to trap particles from your pool water as it passes through the filter. Sand filters have a low initial cost, and a simple cleaning process. Sand filters are found on most older pools in Winnipeg, but are less likely to be installed in new pools today. Cartridge Filters: These filters contain a pleated filament cartridge that works to trap particles suspended in your pool. Although cartridge filters have a higher upfront cost, they require fewer cleanings, and can trap much finer particles. This increases the overall clarity of your pool water. Cartridge filters have a higher efficiency rating, don’t waste treated pool water during cleanings, and require less water pressure to filter the pool water. A cartridge filter costs about twice that of a sand filter. However, cartridge filters are over 4 times as efficient at filtering pool water, meaning that a pool pump will have to work less, and use less power, than with sand filters. We are happy to discuss price differences, advantages, and disadvantages of each type of filter with you, so that you can make the most cost-effective decision for your pool and needs. What Size of Pool Filter Do You Need? With this information, we can help you decide on a size of pool filter appropriate for your pool. As a general rule, the largest filter that you can afford will work best. Larger filters are more efficient, use less electricity, need to be cleaned less, and improve the clarity of the water overall. For assistance or information on cleaning your pool filter, or if you want to know more about choosing the right pool filter for you, don’t hesitate to call UV Pools in Winnipeg today! There is algae in my pool, and my filter is not cleaning it. Why? Your sand filter will not clean live algae. The pool water will need to be shocked or flocked to bring algae to the pool bottom to be vacuumed up. Ensure that you follow the flock chemical manufacturer’s directions on the container. 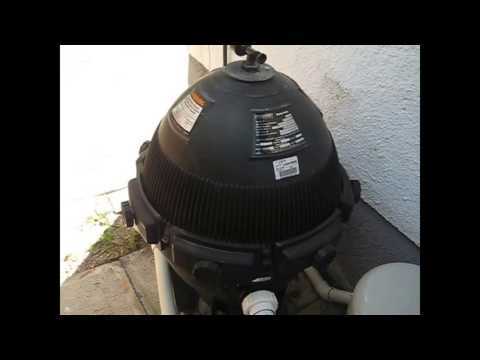 How often should I backwash my pool sand filter? 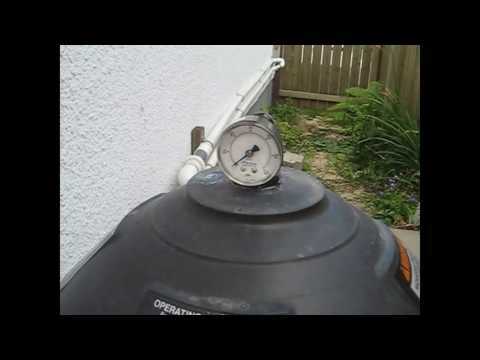 Your sand filter should be backwashed once the pressure reaches above 20-25 psi. Pressure is different for every pool, filter, pipe size, plumbing arrangement, and heating combination, and depends on your particular combination. The psi can range from 15-30 before it requires backwashing. Start with a baseline pressure, which is the pressure your filter runs at right after it has been backwashed. Once that pressure increases 7-10 psi, it is best to backwash it for 2 minutes, or until the clear sight glass bulb is clean. Then, rinse for 1 minute. Backwashing sand filters too frequently is counter-productive, as the accumulated dirt trapped in the sand actually aids in trapping the finer particles in the pool water. Sand Filter: To clean a sand filter, use a sand filter cleaning solution. This solution can be poured into your pump basket when it is turned off. The valve on the front of the pump must be closed before you can start the pump again, for about 10 seconds. Then, you can open the lid of the pump basket, and dilute the remnants of the solution with water. This process will pump the solution into the filter, where it should sit overnight to cleanse the sane. After 12 hours, turn on the pump with the filter handle in the backwash position for 2 minutes, then switch the handle to rinse for 1 minute. Always remember to turn the pump off in between filter handle position changes. Cartridge Filter: Remove the filter cartridges, and soak in a cleaning solution. Hose or off the filters, using low pressure so that the filter pleats do not tear. The goal is to clean between the pleats of the cartridge filter paper elements. Before you clean either type of filter, ensure that you shut off the heater and pump, drain the water, and close all valves before removing the filter head. How often should I change the sand in my pool filter? This depends on how much dirt is going through your filter. Sand filters can work for a few years, up to 20 years with the same sand. This usually depends on maintaining a balanced pool chemistry, and opening up the waste valve when vacuuming up debris and algae. Some say that the sands sharp edges wear down over time, and cease to work as effectively, meaning that it should be replaced sooner rather than later. Ensure that you use filter cleanser to make sure the sand is not clumped together. Clumped sand causes the water to channel through the sand, and not actually be filtered. Why is my pool sand filter pressure so high? Your filter may need to be backwashed. The drains in your filter could be heat damaged from turning off the pump while the gas heater is running. 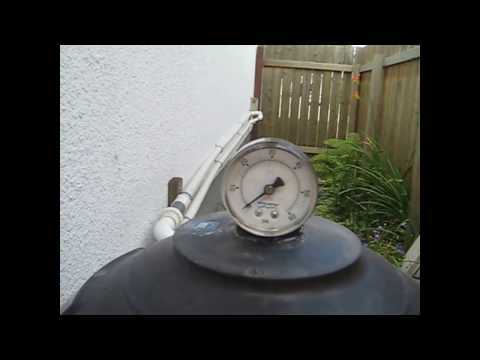 The gauge might be frost damaged from not being removed during Winnipeg winters. This frost damage may cause the gauge to max out and be permanently damaged. Luckily, new gauges are under $10, and can be replaced in less than 5 minutes. What do the handle positions on my pool sand filter do? Filter position: Used when you are running your pool, and need the pool water to be filtered. This is the most commonly used position. Backwash position: This position is only used when your filter is dirty and you want to clean the sand in the filter. Water is reversed through the sand, and lifts out any dirt. It is then discharged out of the waste pipe. Rinse Position: Used only after backwashing. Does same thing as the "filter" position, only water goes out of the waste pipe instead of back into pool. Winterize position: Used in winter to relieve pressure off the seals, so they don't flatten and leak over time. This position also lets air into the filter, to help drain the water out of your filter during winterizing. Whirlpool position: Used when you want the water to bypass your filter. It is most handy when you’re diagnosing pressure problems, or checking how dirty your sand is. Drain position: Use this position when you want the water from your pool to not get filtered, but go directly out your backwash waste hose. This position is also handy if you are vacuuming up debris that you don't want in your pool or filter. This video lists a few advantages of a cartridge filter. As little as possible! You should only backwash your filter if the pressure gauge indicates increased pressure. If your filter is not cleaning properly, it is most likely one of two issues. The first issue could be this you are back washing too often which is not a good thing.